The depictions of elephants throughout human history have represented both positive and negative connotations. They may represent the burdens we all face every day, but they also may represent our collective strength and wisdom as a people. It is the latter which comes forth in the design of the Somalian Elephant silver coin series. In many African cultures, the elephant is seen as the chief, the one responsible for settling disputes when they arise. What won't be in dispute is the value of these silver coins when they are added to your collection or portfolio. The Somalian Elephant features .999 quality fine silver and is available in your preferred condition. Minted in Germany on behalf of the Somali Republic, this silver coin is produced as part of the African Wildlife Series. This means a new design is struck on the reverse side of the coin each year, although elephants are consistently featured with prominence. These silver coins are only available in a 1 ounce size. They are considered to be legal tender in Somalia with a face value of 100 shillings. Coins produced in this series before 2006 have a face value of 1,000 shillings. The first silver coins featuring elephants were produced in 1999, but done so through the authorization of Zambia. It would not be until 2004 when the Somalian Elephant would make its debut on the world stage. Because the Bavarian State Mint in Munich has continued to produce these silver coins since their initial introduction, sometimes you will hear them referred to as the Zambian Elephant instead. 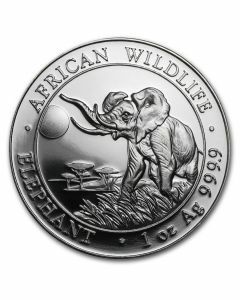 Most of the silver coins produced in the African Wildlife Series are made in BU condition. You will find, however, that there are numerous other collectible options that are struck at the mint every year. The amount of availability when compared to other popular silver coins is also limited. In 2012, for example, only 80,000 coins in this series were created. Yet despite this, specific mintage numbers are actually quite difficult to verify. Coins produced in 2004 or after tend to have the most accurate counts, yet between 2004-2008, it is believed that only 5,000 Somalian Elephant silver coins were produced annually. This makes the early coins in this series to be in especially high demand. Because the reverse of the coin features a new elephant design every year, collectors can determine which year the coin was struck based on both the year and the design itself. Most designs feature elephant herds exploring the Somalian vistas that include grasslands and a sunrise or a sunset, but some feature a striking single bull elephant as well. “African Wildlife” and “Elephant” are included on the reverse as well, as is the weight and purity of the silver. The obverse of this silver coin is consistent, depicting the coat of arms for Somalia. This features a shield with a single star that is being held by two upright leopards, which are standing on large crossed spears below them. “Somali Republic” and the face value of the coin are also included, as is the year the coin was minted. Is the Somalian Elephant Silver Coin Right For You? The imagery of elephants for many around the world goes beyond strength and wisdom. Elephants are also believed to provide households with good luck and financial stability, which makes them the perfect symbol for these silver coins. 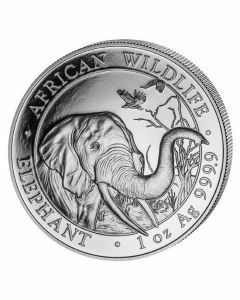 Because silver is often purchased as a hedge against inflation and to protect a portfolio against economic uncertainty, the Somalian Elephant designs within the African Wildlife Series may do just that for the average investor. 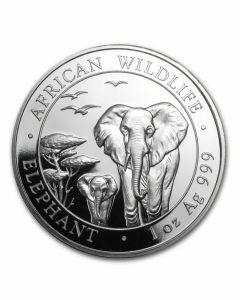 If you have any questions regarding the quality or craftsmanship of these silver elephant coins in the African Wildlife Series, please feel free to contact us at your convenience.